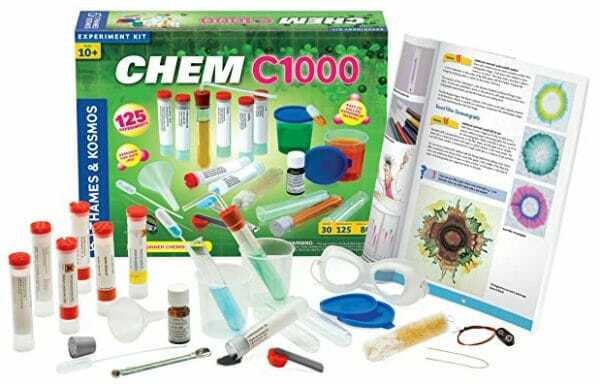 Finding the right chemistry set that will keep your child entertained as well as help them along in their science education can be difficult. The heirloom kit that was iconic of youth for so long has faded into a rarity. Instead of focusing on education and science, almost all modern products are intended to be mere toys. However, there are still a handful of legitimate, science-based ones produced. 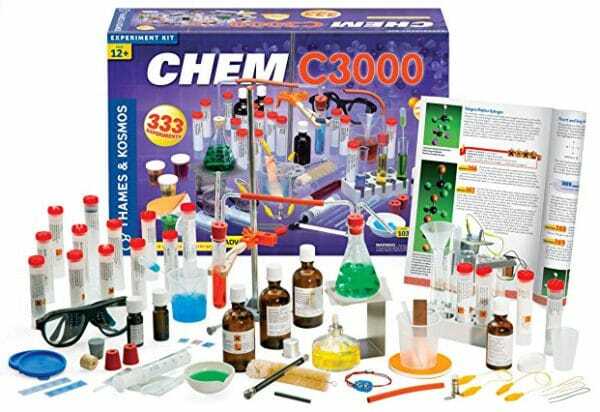 These are the top 5 chemistry sets that we could find anywhere. They include everything you will need to encourage your children in this area of science and keep them, and you, entertained too. 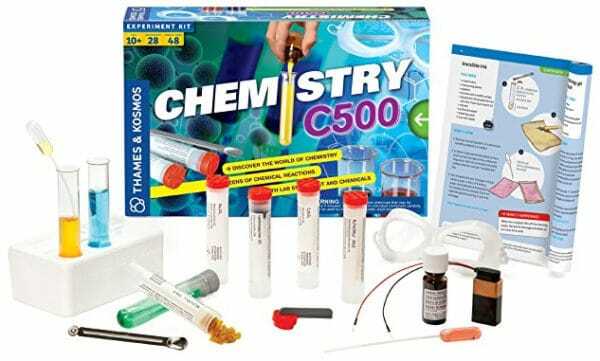 The kits we’ve included are best for a household with kids ten and older, with the larger ones even being at an adult level and a perfect gift for anyone wanting to experiment and continue learning in their own lab. We have listed our favorites in order of complexity, from least to most advanced lab kit for kids or adults. Designed specifically for teaching the fundamentals, this has detailed full-color illustrations for each of the 27 projects recommended. At this age, so many kits dumb down the real science, but the kit does a good job of keeping it entertaining while not losing focus on understanding the science at work. An example of this is an experiment with plaster to make test tube racks, which they will use in further experiments. 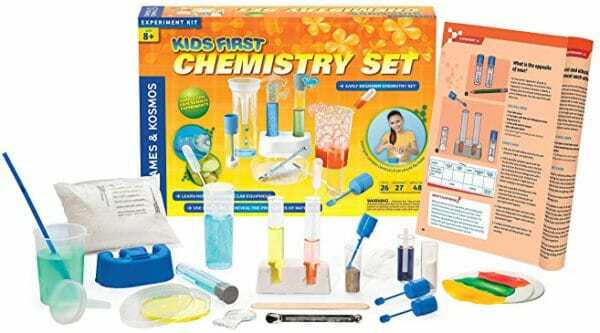 With hands-on fun, this set helps establish an understanding of crystallization, color, thermal flow, and evaporation. In the process, kids will also become familiar with the basic equipment used in chemistry. Focus is on the differences between solids, liquids, and gases as well as how they react. It also introduces electrochemistry with metals and salts. This may sound like a big step for a 10 year old, but the science is all easy hands on fun and not textbook serious. This results in the student getting acquainted with slightly more advanced concepts, without feeling like they are playing with a toy instead of a science kit. Experiments include a color changing litmus solution, crystal growth, and how to make an invisible ink. As should be expected, you will need to buy some things locally since the kit only has chemicals and tools that are safe to be dropped by the postman. Educational and fun, but still teaches real science. Greater safety for younger kids. Introduces STEM in the kitchen. Labeled as being for 10+ years, this kit is significantly more advanced than the one above and is definitely not a toy. Quite frankly, it depends on your 10 year old. If they are total scientists, get this. If they have their mind on other things and you just want to introduce the subject and spark a scientific interest, then the chemistry set above is a good choice. 125 experiments are laid out with detailed instructions in an 80 full-color manual. This delves into the physical properties of fluids and experiments with air pressure and the surface tension of water. There is some duplication in the subjects covered with the previous set, but the C1000 also continues exploring electrochemical reactions by dissolving metals. My personal favorite is the simple experiment of splitting water into hydrogen and oxygen. Through simple electrolysis, children can begin learning how chemistry can literally change everything, and how the components of molecules can have very different properties than the molecule itself. 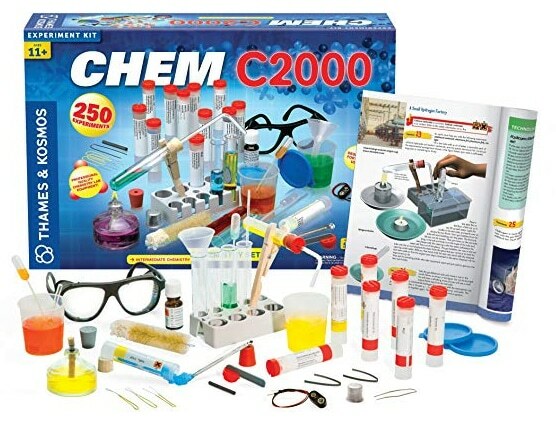 This is a 50 piece intermediate kit, with 250 guided chemistry experiments and the addition of an alcohol burner. It continues the exploration of electrochemistry and introduces research involving chemical combustion and heat. The alcohol burner greatly increases what can be done with this kit. Because you can involve high heat, you can catalyze reactions and explore the separation of mixtures. Stronger acids and bases are used to explore metals like aluminum, iron, and copper while still being fairly safe for a home setting. 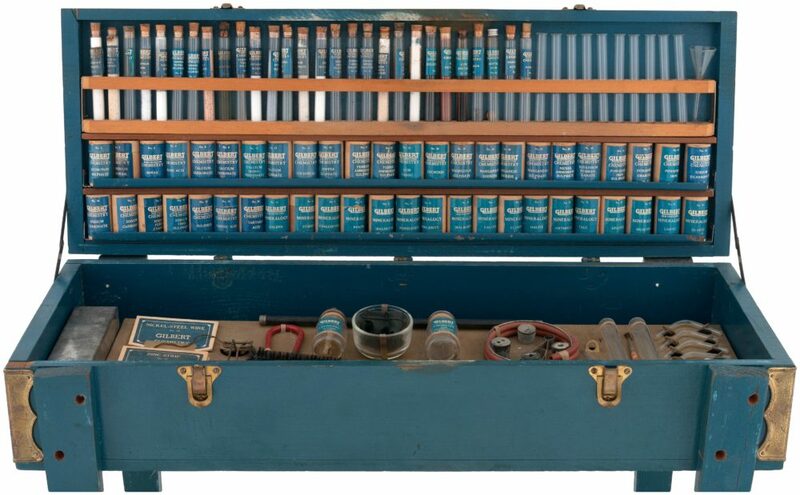 A more scientific chemistry set for a similar price. Kids make slime, crystals, and volcanos in their home science lab. Activities for kids up to 12 years old. This is the ultimate lab for any young scientist and an excellent starter for adults. It includes everything in the C2000, with dozens of additional chemicals and lab equipment. The following is a list of just some of the highlights of the C3000. These are just the highlights of this set. It includes a lot more supplies than it makes sense to list here and a complete selection of hardware that you will need to carry out over 300 experiments. You can find the full list of what the kit includes, and the current price, at the link below. The experiment manual is written at a higher level than the chemistry kits above, but it is still full of illustrations and explanations. Through performing educational science experiments, the guide helps the child learn about the periodic table, chemical equations, and atomic structures. The projects cover general and organic chemistry, with experiments ranging from “Metal ions as oxidizing agents” to “Redox reactions of the halogens”. You will be learning about the chemistry of Chlorine, Bromine, Potassium Permanganate, and Hydrochloric Acid, among other chemicals, so parental or school supervision is a must for safety. This is a great chemistry set for anyone that already has a basic foundation in chemistry and wants to take their knowledge and abilities to a higher level or set up a lab and do their own research. It is also the most complex, complete and high-quality kit we’ve found at any price. This kit will serve your child scientists through high school and will be fascinating for most adults. Enjoyed the graded levels of these sets. Couldn’t help but notice a single-brand focus, though. Wondering, where would you recommend an older adult with no chemistry experience start? I have no qualms about beginning with the little kids set, if that’s what you recommend. That bothered us too, and we looked for variety but what we found was that Thames & Kosmos had the best sets and we just couldn’t get around that. Once you get passed the level of the C3000, you really need to be assembling your own kit piece by piece. If you have no chemistry experience but want to start learning and doing your own research, I would get the C3000 to get started. It gives you a running start and the experiment manual should be a great learning experience as it’s not exactly starter level. Once I went through all the experiments and was comfortable with terminology, etc., I would source additional supplies and chemicals individually from EBay. It’s amazing what they have. If my budget allowed, I might buy my lab ware new but in reality glassware is glass so you should be able to wash most of it well enough and save a lot of money. I bought this kit for my kid last year. This is a perfect kit for any adult just beginning. This kit also requires a few extra chemicals not supplied, so be ready for that. Im buying this kit again this year it was so much fun! It really is a great kit for any age. Lots of fun along with this kit!